IMPORTANT UPDATE!!! 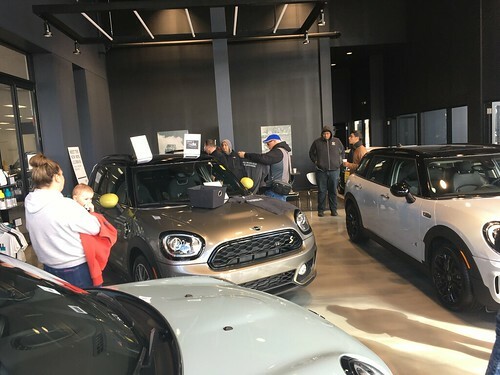 The South Bend Mini Event will be held without the autocross. We were not able to arrange for a better insurance package, and fell short of the 50 pre-registrations required. All who registered for the autocross event will get their checks back. WE ARE STILL HAVING AN OCTOBER 4th EVENT!!! 9-10:30 AM — Meet at The Tire Rack, meet Mini owners, meet Alex, tour (parts) of this amazing performance facility. Noon-2:00PM — Lunch at Hacienda Mexican Restaurant at the historic Kamms mansion. www.haciendafiesta.com Order off the regular menu, all your food will be FREE! For your margaritas, Coronas, whatever-you-want-to-drink, you are on your own. Come share a wonderful autumn day with Mini enthusiasts! While this news is certainly disappointing for many of us I'm still planning on going and having a great time. In fact I'm probably going to come home with some tires from the TireRack. Who can still make it? The next track day has been announced and will be held on Saturday, November 15, at Gateway International Raceway.? The rate listed on the web is $175 if booked before November 1.? The discount rate of $140 is good for MINI club members only. Join us for a big meeting about the MINI! Windy City member (and BMW owner) Gabe Bridger of the newly formed Chicago MINI Motoring Club (www.chicagominiclub.com) will give us the lowdown on the state of the MINI world and tell us about the MINI community that's cropping up all over the US. Of course this also includes Windy City events! We're also hoping to have information about upgrades and aftermarket mods you can do to your MINI. This is shaping up to be a great meeting for anyone who owns a MINI, rides in a MINI, or just daydreams of a MINI! Bill Jacobs BMW/MINI is located at the intersection of Ogden Avenue and Jefferson Street in Naperville. The easiest way to get there is to take I-88 west to Rt. 59, go south on Rt. 59 and make a left at the light on Jefferson Street (Portillo's on corner), and go straight a couple of miles to Ogden. PARKING WILL BE IN THE LOT ACROSS FROM BILL JACOBS, BEHIND THE GEMATO'S GRILL RESTAURANT. For those of you in the Chicago MINI Motoring Club and might be interested in more track time and further benefits (the monthly magazine the Roundel for one) I recommend also checking out the BMWCCA. They're happy to welcome MINIs into the club and we at the CMMC are looking forward to working with them on the future on joint events. The club is hoping to have a small event showing the original Italian Job at a local dealer sometime in October. The only issue is we'd be very limited in terms of space due to dealer seating. That is unless someone else has a better idea for a location. For a couple months now there have been rumors going around the Internet of a huge gathering of Mini/MINIs in Las Vegas, NV. This is to inform you this event is an official Arizona Mini Owners (AMO) event. AMO club membership is not required to participate. Both classic Minis and new MINIs are welcome! Each participant is responsible for their own expenses, including, but not limited to, gasoline, lodging, meals, tolls, park fees, show admission, etc. The fun is starting Friday February 6th, 2004 and continuing thru Sunday February 8th, 2004. Turn this event into your family vacation. Make new acquaintances. Make it a long weekend of fun. This is not your typical gathering in Vegas. There will be no key-note speaker, no name-tags, or the things you associate with conventions in Vegas. The Mini owners I know are much too relaxed to put up with that. What there will be is plenty of group motoring activities and tons of great company amongst Mini owners! Schedules will be flexible. This is supposed to be fun, right? Remember, there?s something for everyone in Vegas! In addition to things to do while in Vegas, other activities may include group picnics, drives to local attractions and some fun site-seeing drives. Group rate accommodations have been arranged for this event at the Stardust Resort & Casino for only $75.00 per night for Friday and Saturday nights. This is an excellent rate for a hotel right on The Strip! Thursday and Sunday nights will be at non-peak rates meaning they will be much lower. You will need to make your own reservations by calling 1-800-634-6757 and mention group code ?MINI206?. The cut-off date is January 7th, 2004 to make reservations under this group code. Room tax, telephone, energy surcharge, and other charges may apply. When making your reservations your credit card will be charged immediately for the first nights stay. This is to secure your room. You can cancel your reservation up until 48 hours prior to arrival time, but there is a cancellation penalty. If there are fewer than 15 rooms rented per night for either Friday night or Saturday night, they will remove the discount for everyone. Be sure you understand Stardust?s reservation policies prior to making your reservation. You are not required to stay at the Stardust for this event. Feel free to make your own accommodations. However, all fun-runs will start from the Stardust?s parking lot. There are some off-Strip hotels that aren't as cool as the Stardust, but may have a better price. Contact agro@ragingbull.com for further details. We encourage regional Mini clubs organize their own group drives to and from Las Vegas. Contact your local club to get the ball rolling, or if you don?t have a local club, I'm sure you can find other like-minded Mini/MINI owners to motor with from your location. It?s been rumored that people as far away as Florida are planning to motor out to Las Vegas for this event! Don?t miss out.